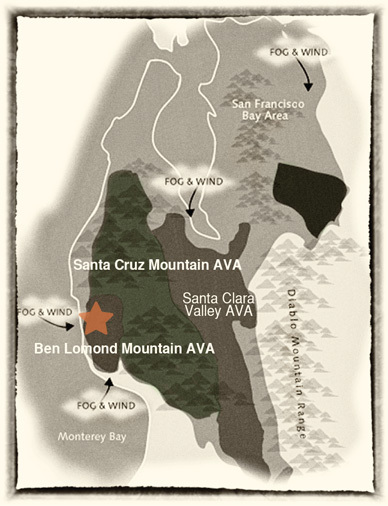 The Ben Lomond Mountain AVA (American Viticultural Area) is located in Santa Cruz County, CA on the Western edge of the Santa Cruz Mountains. Vineyards were first planted on the mountain in the 1860's, but the area did not become famous for Pinot Noir until the 1970's. The four by sixteen-mile AVA reaches altitudes as high as 2,600 feet above sea level, placing it above much of the fog that rolls in from the Pacific Ocean, ensuring long hours of sunlight. The elevation and ocean proximity ensure a cool climate, where grapes can ripen over an extended growing season. Wines are highly structured, have good minerality and are extremely age worthy.